ActiveOver50, a Bay Area magazine written for baby boomers and older adults, announced that ad sales revenue grew 26% in 2009 when most publications lost 30% or more. The privately held media company based in Los Gatos said it remains profitable for the third straight year. Published quarterly, ActiveOver50 magazine said it reaches more than 150,000 older adults in print and online. 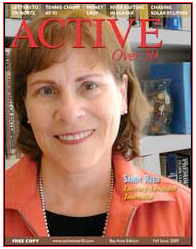 The latest issue of ActiveOver50 features literacy tutor and noted journalist Sandy Reed on the cover. She worked as executive editor for the Mercury News and the Miami Herald and served as editor in chief at Personal Computing and InfoWorld.